I’m starting another challenge today. This one is the brainchild of Missy from Gnarly Nails, and is being run through her Glittah Pirates Facebook group. 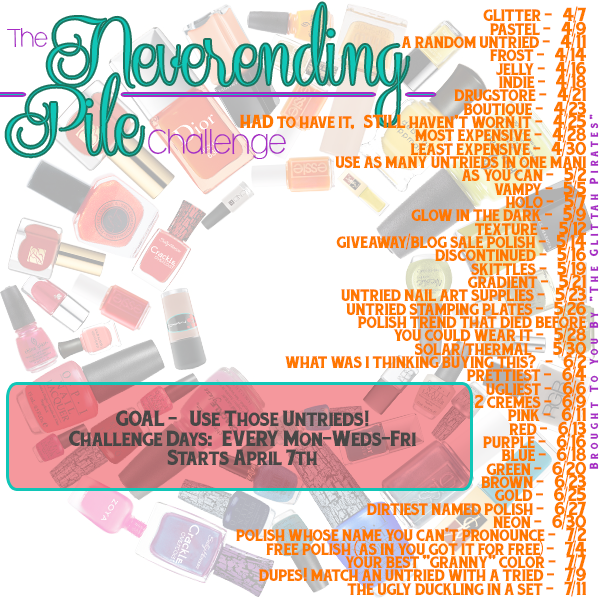 It’s the The Never-ending Pile challenge and the quest is to use up all those untried polishes we addicts hoard. As at today, I have 229 unworn polishes. That represents nearly 42% of my stash (which is at 552 for those of you who can’t be bothered to work out the maths!) That’s far too many and this challenge will certainly help me to get through some of them. I’m not going to do all the prompts, as that would mean posting five times a week if I include the other two challenges I’m doing. But I’m going to dip in and out and see how I go. The first prompt is glitter, and I certainly have loads of those. I’m pleased to have rescued one from the never-ending pile though today: it’s W7 Lava Flow. I used three thin coats, without undies, and then added in some red and black stripes to two of the nails, using W7 Black and Barry M Blood Orange. Do join us in this challenge if you want. There’s no obligation to do all the challenges – just choose the ones you fancy – and you don’t even have to do nail art if you don’t want. For more info, join the Glittah Pirates Facebook group. Yes, I know what you mean. I’m doing GOT and FingerFood’s Theme Buffet, and this would be an extra three on top of those two. But it’s fine just to do swatches; it doesn’t have to be nail art. And you don’t have to do them all either. I think I’ll just do one when I feel I can. Holy lots of untrieds! I know I have some, but hopefully not a lot. Maybe I should figure it out.. So … did you count them? Okay, you convinced me to count mine. I’ve got about 65, more than I thought! Yes, it can be scary when you realise. I am so obsessive that I have a spreadsheet that keeps a continual count! Great choice of mani! I super love the glitter that you have used here. Go go go!!! !